This is a special Beard of the Week! It’s 2 AM, but as I drunkenly stumbled into my room from the bar I saw a package on my bed which was awesome because it means I got my new computer power adapter three days earlier than expected! So I needed to do SOMETHING moderately relevant with my computer to celebrate. I’ve decided that the best way to honor beards is by keeping it to celebrities of some sort. However, whenever it is applicable, a special “local guest” will additionally be honored. Deemed appropriate by yours truly. First off is our weekly honoree. This week I decided to take a turn to the musical side of things, to a man that was born and raised in South Carolina and is thus spewing tons of Southern charm to us Yankees who don’t know any better. 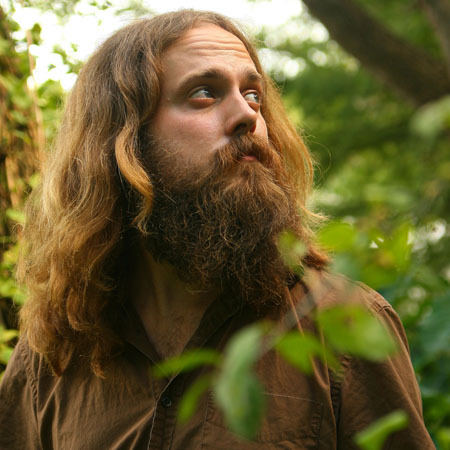 With his lovely vocals and surprisingly endearing sense of humor, I bring you Sam Beam, of the Iron & Wine fame. Look at that! It’s a thing of beauty! I had the pleasure of seeing that lovely beard in person last spring at Mass MoCA, where Iron & Wine played and subsequently blew my mind, but guess what I was most awestruck by. You think it’s nice in a photo? Imagine it in person! Not only is he beautifully bearded, but he’s a wonderfully humble and simply nice guy. Totally deserving of this weeks award. And now it’s time for our first local guest here on Beard of the Week! A man who needs no introduction, a man whose birthday was yesterday, a man who donated an extra X chromosome to my mother’s X, Mr. Gary William Mitchell, my dear old dad. That photo is from three years ago, but the beard remains the same. And yes, he is that Legendary. I should also add that he bought me a car for $300 today. That’s it for this week! Next week is going to be wild! Keep an eye out for my Halloween costume, another bearded man, and a special Movember addition as well! Movember raises money for men’s cancer awareness, and on Wednesday night our favorite local bar will be hosting a shaving event, the man who auctions his beard off for the most money will be featured here on Beard of the Week. Here’s a link to get further info on what it’s all about. Until then! Keep those beards growin’!